The remote controlled flying witch is a must-have item for any Halloween enthusiast. Otto Dieffenbach constructed the device and released a video that shows his work in action, which has led to a ton of inquiries about where to buy one. The video shows the witch flying through San Diego, cruising above the water and then through the skyline, passing over the moon for added spookiness. It's amazing how realistic it looks as it navigates through the air, just begging to be invited to a Halloween party this year. There's good news and bad news for people who want to get their hands on the flying remote control witch. First the good news: It's available to purchase and only for $149.99. The bad news: It's a kit, which requires some pretty heavy duty building expertise. Otto Dieffenbach calls the project his Broom Witch and warns potential buyers to have pretty decent skills or at least know someone that can help you construct the witch. Adding to the bad news is that one has to buy the electronics separately, adding to the difficulty of the build and the cost. The flying witches are constructed from light-weight cardboard with Otto Dieffenbach's innovative design and engineering work. The Broom Witch is pretty big, but Dieffenbach says that anybody with basic knowledge of flying remote controlled models will easily be able to get the hang of flying her around. He also added that he can make custom builds for the face, so you could make the witch out to be anybody, or perhaps you would like a wizard instead. No problem, Dieffenbach has you covered. Otto Dieffenbach started the Broom Witch in 2012 with a miniature version and has since made the full size version that Halloween fans are so pumped about. She continues to be a crowd favorite at Air Shows and local Halloween events. The device has appeared on local, National and International TV. 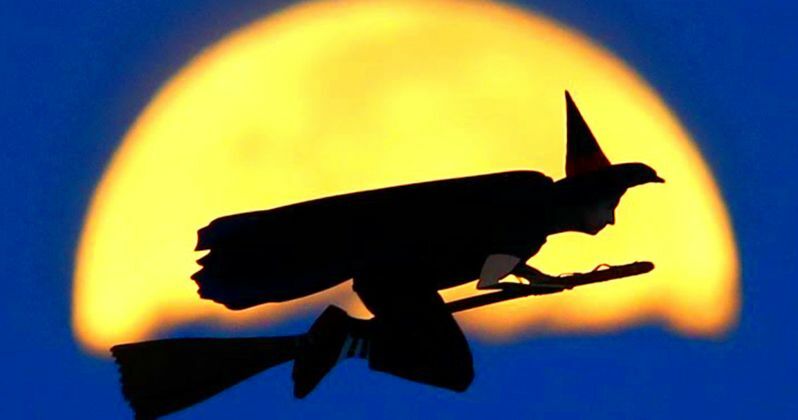 Plus, Dieffenbach's 2014 video of the Broom Witch has amassed 18 million Facebook views after the Discovery Channel and Tony Hawk's Halloween Party appearances. The engineer is clearly happy with all of the attention that his creation has gained in the past handful of years. The Broom Witch build website has thousands of views for each build instruction, so it's puzzling why we haven't seen more of these things flying around during Halloween. You'd think that Universal Studios' Halloween Horror Nights would have them flying all around the theme park just before dark, or even at Knott's Scary Farm. The build instructions might be a little harder than initially thought. With that being said, one has to wonder how much Otto Dieffenbach would charge for a full complete build. You can contact him and buy your kits over at This Is Why I'm Broke and then watch a video of the flying witch in action below.